My brother-in-law went through security at Auckland domestic airport and witnessed a passenger having to fish out her nail scissors from her handbag and leave them behind. He went through security and then boarded his plane. After being seated he could smell petrol. He knew you shouldn’t be able to smell petrol on a plane, because planes don’t use petrol. The smell got worse and eventually he got the attention of one of the flight attendants. They started to look around to see where it was coming from. They found in the overhead compartment a chainsaw in a bag that was leaking petrol into the compartment. His plane was delayed as the owner was identified and the chainsaw removed and put with the main luggage. The owner of the chainsaw said security had stopped him but had let him through because it wasn’t one of the things on their list to confiscate. Well, that’s good news for Klingons at least…no need to leave their Bat’leth at home any longer! With cyclone Johanna forecasted as the worst of the 2007-2008 winter for UK and Ireland, I am worried that the proverbial BBC fixation for understatement will leave people unsure on how bad it can really get. Well, IT CAN BE AS BAD AS ONE CAN IMAGINE…MAYBE WORSE!!! This is what the BBC Weather warnings page has to say: Sunday 9 March EARLY WARNING An intense area of low pressure is forecast cross the UK on Monday. Both wind and rain will be notable with potential for disruption to transport and power supplies. England and Wales look most at risk at the moment, with gusts of wind up to 70mph, locally 80mph for exposed coasts and hills Further updates will appear here. There is an article “Flood alert amid storm warnings” but despite the warnings affecting millions of people, it’s not the main story and will be surely and easily missed by most. But enough of the BBC: Anybody living in England should prepare for extremely awful conditions, and as far as I know the areas around Birmingham and on the west/south coast can be hit particularly badly. The Met Office continues to expect an intense low pressure system to move east across the UK during Monday, bringing severe gales and potentially damaging gusts across some areas, more particularly the west and south of England and Wales. Southerly winds are expected to strengthen during the early hours of Monday to give severe gales for a time, coinciding with the morning rush hour in some areas. An additional swathe of severe westerly gales will follow through the morning and afternoon, principally affecting southwest England and the south coast of England. Gusts of 60 to 70 mph are likely with the possibility of 80 mph gusts on exposed coasts and hills. Disruption to transport and power supplies is possible and there may be damage to buildings and trees. In addition high waves and flooding may affect coastal areas in the south. This warning is likely to be superseded by FLASH messages. All eyes are now on Storm Johanna which is set to be the most powerful storm system this Winter to hit the UK. OK, so how’s the system going to develop and what can we expect? First of all, Johanna is going to have two main parts, the first is the warm front with the heavy rain and strong winds which will sweep East overnight tonight and into Monday. The second is the severe gales which will push into the South-west during Monday afternoon. A thoroughly wet, windy and miserable start to Monday for many areas. Gales or severe gales will sweep across many Central and Southern areas with winds of up to 50mph inland and even higher gusts which could bring down trees and cause structural damage. Then a slight lull around Midday as the storm passes over the Irish Sea. Into the early afternoon and the wake of Johanna slams into the South-west with winds of up to 90mph, gusts slightly higher. The worrying side at the moment for the South-west is the storm co-inciding with the high Spring tides. We are aware that many will want to see the worst of the weather along coastal areas in Devon and Cornwall, however the situation is severe enough to cause loss of life for people who don’t understand the effect of these two components. Waves of up to 45ft can be expected along the North Cornish coast. This, compounded with high tide around 6pm and the Spring tide at this time of year will result in elevated sea levels and possible breaches of sea defences. We’ll be following Johanna throughout Monday bringing you the latest on the system, we’ll also be heading to Cape Cornwall to bring updates on the system with real-time images and reports. Let’s hope all these forecasts and warnings will be shown wrong. But with a little more than seven hours to go before it starts, chances that the weather models are incorrect are very slim. Best Western Garden Inn in Salt Lake City – Thinly spread out, double unguarded entrance means not everybody on its grounds is a guest or worker. Avoid room 419 if hoomping water heaters can wake you up. Best Western Cross-Winds Motor Inn in West Yellowstone – Nicer than expected, pretty much motel-like plus jacuzzi and pool. Curiously worked at mostly by people from Slovakia. Best Western Mammoth Hot Springs in Gardiner – Good but without free continental breakfast. You won’t want to go to Gardiner for the food anyway. Fantastic riverside views on wilderness from rooms 403 to 419. Cabins in Canyon – Frontier-like with little amenities but best location to access the park from within. Comfort Inn in Cody – Definitely upscale, most expensive and very comfortable but where is the elevator for the rooms upstairs? Best Western Driftwood Inn in Idaho Falls – Pleasant surprise with great rooms and decors, pint-size easily-accessible pool, a few steps from the falls and with its own fall-in-the-wall by the entrance. Not by a long shot: Best Western Garden Inn Salt Lake City, as it doesn’t check for stangers in its (enclosed but not locked) grounds. Gardiner, MT – curiously tiny and spread over a long, winding road; somehow it looks like it should have some character, but it’s hard to find. Don’t go there for the the food, period. Idaho Falls, ID – a curious place where the “downtown” area is also run-down, even worse than central Philadelphia. Then you cross a bridge and it’s a clean, quiet and fun place for the whole family, with impeccable riverside grass, views on the falls, plenty of restaurants. While the Leaning Tower of Pisa’s Piazza dei Miracoli is world-famous, its just-as-leaning Pisan siblings are virtually unknown. It is half a mile south from the Leaning Tower. It is actually an almost identical twin, albeit attached to its church and with the columnade on the inside. 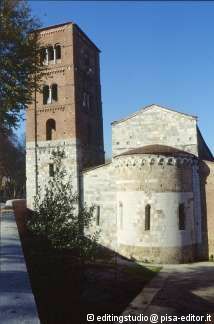 The other church tower that failed to remain vertical is a few miles to the east, by the Chiesa di San Michele degli Scalzi. In this case, the whole church is leaning to one side too. Apparently, the builders noticed there was something odd about their work, and completed the bell tower with light bricks instead of the heavy stones they had started with. If you can close your bag, it means there is space for at least another item. Maurizio’s Corollary #1: if you cannot close your bag, you are not pushing hard enough.